Fig. 3. 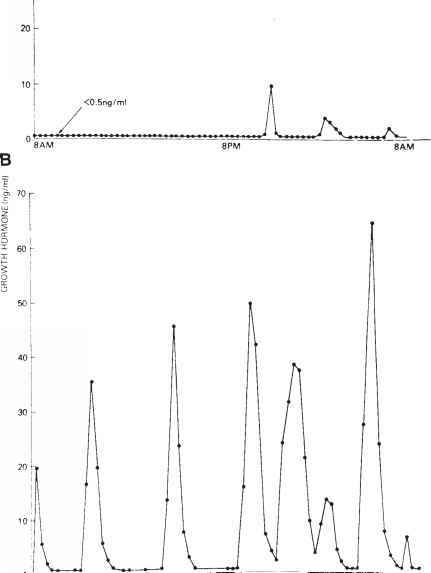 Spontaneous pulsatile growth hormone secretion in (A) a representative patient with acute lymphoblastic leukemia who had received CNS-preventative therapy with 2400 rads cranial radiation and intrathecal methotrexate, and (B) a representative normal child. Reproduced with permission from ref. 47. A study of 82 children (0.2-18.9 yr; median 4.3 yr) following cranial or craniospinal irradiation with doses between 24-45 Gy for primary brain tumors not involving the hypothalamic-pituitary axis or prophylaxis against central nervous system leukemia identified a GH deficiency in 74% (insulin hypoglycemia). Children receiving doses greater than 30 Gy developed GH deficiency faster, with 100% of subjects GH-deficient within 3 yr (49). Analysis of GH secretion in 28 children with ALL 4.1-10.6 yr (median 8.2) following treatment with 1800 cGy of prophylactic cranial irradiation identified 64.3% GH-deficient after arginine and levodopa provocation and 81.5% with diminished overnight spontaneous GH secretion. These biochemical abnormalities correlated with magnetic resonance imaging findings that included empty sella in 25% and a reduction in anterior pituitary lobe height correlating with the GH peak response to arginine and the mean overnight GH concentration (50). Replacement therapy with biosynthetic hGH increases growth velocity in GH-deficient subjects following cranial irradiation, but final height is significantly less than the midparental height. These findings are reflective of the lag time before initiation of hGH therapy and the detrimental effects of irradiation, especially to the growing spine, in young children (51).